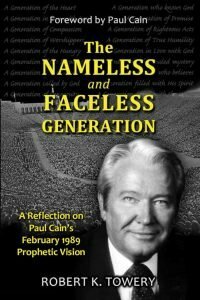 In February 1989, at the Anaheim Vineyard during a conference, I prophesied a time when athletic stadiums and arenas would be filled with God’s people preaching the gospel and healing the sick in extraordinary fashion. In my vision I saw ambulances bringing in the worst medical cases, the local hospitals being emptied to deliver their patients to these events, and the dead (dead people!) being raised by an army of nameless and faceless Christians releasing a wave of miraculous healings and conversions. This vision encompassed multiple venues over an extended period and spoke of God’s glory being released in an unprecedented manner and on a scale that had not been witnessed before. In short, this work was not the result of men; this was the work of the Father himself! In my vision, the international media were reporting the amazing events as they took place. This was the news of the day: every channel, every station, and every nation. This was not an isolated Christian event, the kind that is well known and publicized in the Christian community, yet even the immediate neighbours of the event have no clue what is happening inside; rather, this was a series of events that would affect the world and the communities around the stadiums and arenas. It is a wonderful picture of an entirely possible and biblical scenario. I declared this to a large audience who were familiar with God’s presence: but this was a vision far beyond anything even that crowd could encompass at the time. This book, written by Robert K. Towery is about that vision.